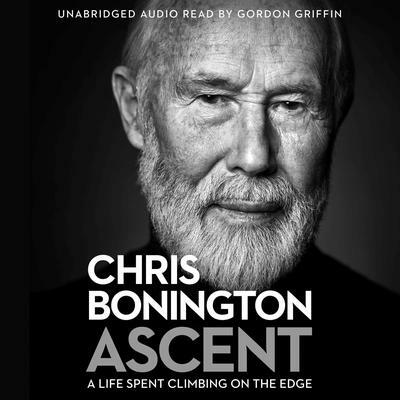 Hear Sir Chris Bonington’s extraordinary story, read by Gordon Griffin. His memoir Ascent charts not only his many triumphs in the climbing world – such as the Eiger, and the Himalayas – but also the struggles he has faced in his life bringing up a family, and maintaining a successful and loving marriage over the decades of travelling the world to conquer mountains. He has undertaken nineteen Himalayan expeditions, including four to Mount Everest which he climbed in 1985 at the age of fifty, and has made many first ascents in the Alps and greater ranges of the world. Along the way his many adventures have included meeting the mercurial Dougal Haston; the legendary-tough Don Whillans, the philosopher of the rock Stephen Venables, and the enigmatic Doug Scott, plus many more.Ascent is a memoir like no other – a timely and uplifting narrative for anyone who has ever dreamed of adventure. 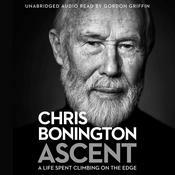 Hear Sir Chris Bonington’s extraordinary story, read by Gordon Griffin. His memoir Ascent charts not only his many triumphs in the climbing world – such as the Eiger, and the Himalayas – but also the struggles he has faced in his life bringing up a family, and maintaining a successful and loving marriage over the decades of travelling the world to conquer mountains. He has undertaken nineteen Himalayan expeditions, including four to Mount Everest which he climbed in 1985 at the age of fifty, and has made many first ascents in the Alps and greater ranges of the world. Along the way his many adventures have included meeting the mercurial Dougal Haston; the legendary-tough Don Whillans, the philosopher of the rock Stephen Venables, and the enigmatic Doug Scott, plus many more. Ascent is a memoir like no other – a timely and uplifting narrative for anyone who has ever dreamed of adventure. Chris Bonington was educated at University College School, London and the Royal Military Academy at Sandhurst. He was commissioned in the Royal Tank Regiment in 1956. He spent three years in North Germany in command of a troop of tanks and then two years at the Army Outward Bound School as a mountaineering instructor. It was during this period that he started climbing in the Alps, making the first British ascent of the South West Pillar of the Drus in 1958 and then the first ascent of the Central Pillar of Freney on the south side of Mont Blanc in 1961 with Don Whillans, Ian Clough and the Pole, Jan Dlugosz. At that time this was one of the most difficult climbs in the Alps and even today is considered one of the great classics of the Mont Blanc region. He made the first British ascent of the North Wall of the Eiger in 1962.